Seven wonders of Kharkiv – are seven historical and cultural monuments, which were chosen at the competition “Seven wonders of Kharkiv” in July 2008. The monument to T. Shevchenko was built in 1935 at the entrance to the garden of the same name. It’s considered to be the best among more than 250 monuments to T. Shevchenko in all over the world. It took more than a year to create this monument of art. It’s a 16,5 meters monument that consists of a bronze statue of Shevchenko (5,5 m) that stands on a round base of natural silicate. The statue is surrounded by 16 smaller bases with bronze figures, which illustrate the characters from history of Ukraine and Shevchenko’s works. 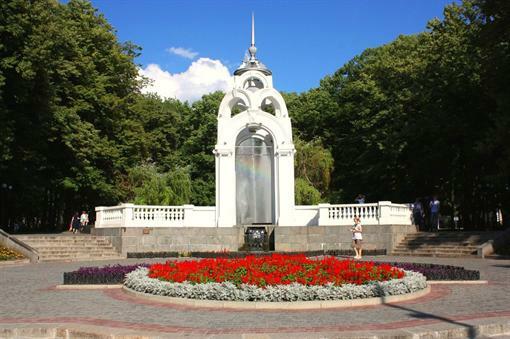 “Zerkalnaya struya” fountain relates to the most outstanding architectural buildings of Kharkiv and is one of its symbols. It’s under the protection of UNESCO. It’s located on Sumskaya Str., in the public garden opposite Opera theater. 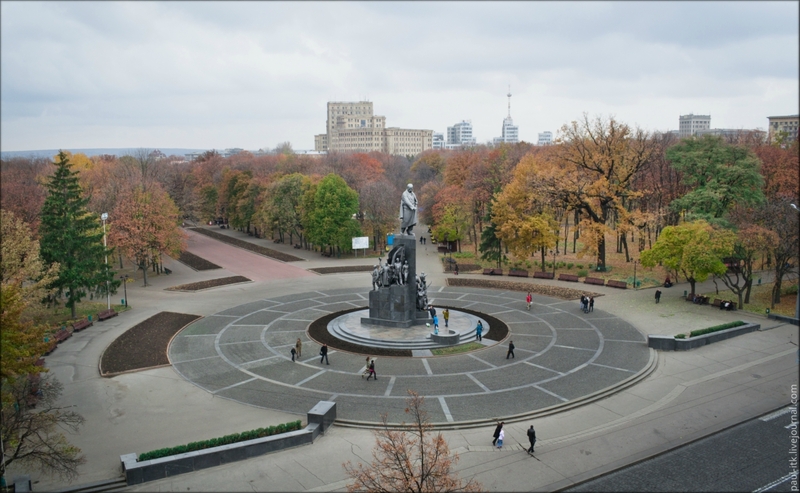 It was built in 1947 in honor of the victory of soviet people in the Great Patriotic War. It’s executed in a shape of pavilion, under which the mirror water stream flows down. Today there is a picturesque public garden around it. In front of the fountain there are beautiful flowerbeds, and a romantic pond of irregular shape is behind them. Zerkalnaya struya is one of the most favorite places for meetings and resting of the citizens. It was founded by the Cossacks, which have built it in 1689 as a part of fortification. In the 18th century the Intercession Cathedral buildings were used for the lessons by the students of Kharkiv college, where in 1759-1764 Grigoriy Skovoroda – a very outstanding Ukrainian pedagogue, poet and philosopher was teaching. 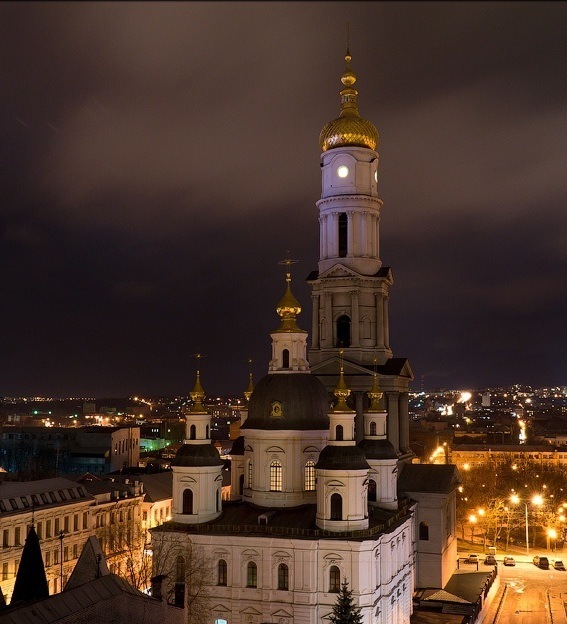 At the present time Intercession Cathedral is the oldest stone monument of architecture of the national meaning in Kharkiv. 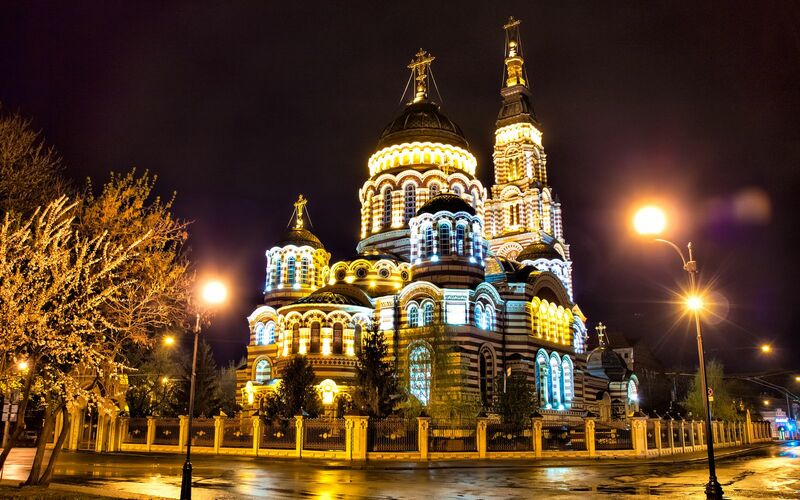 This temple is a bright example of neo-Byzantine architectural style, with 80 meters belfry. It was built between 18889 and 1991 by the project of one local architect Michael Lovzov. It’s capacity is 4 thousand people. It is a Cathedral of Kharkiv eparchy of Ukrainian Orthodox Church (Moscow Patriarchate). Patriarch of Constantinople Afanasiy III and several saint bishops are buried in the Annunciation Cathedral. The Cathedral is situated on the University hill on the bank of Lopan’ river and is seen from any part of the city center. The belfry, executed in neoclassic style, was built in 1820-1830-ss, and the full height of the building reaches 90 meters. The Cathedral was the tallest building in the city till the 21st century. After the restoration there has been opened the House of organ and chamber music. The organ, made in Czechoslovakia, is placed instead of sanctuary. 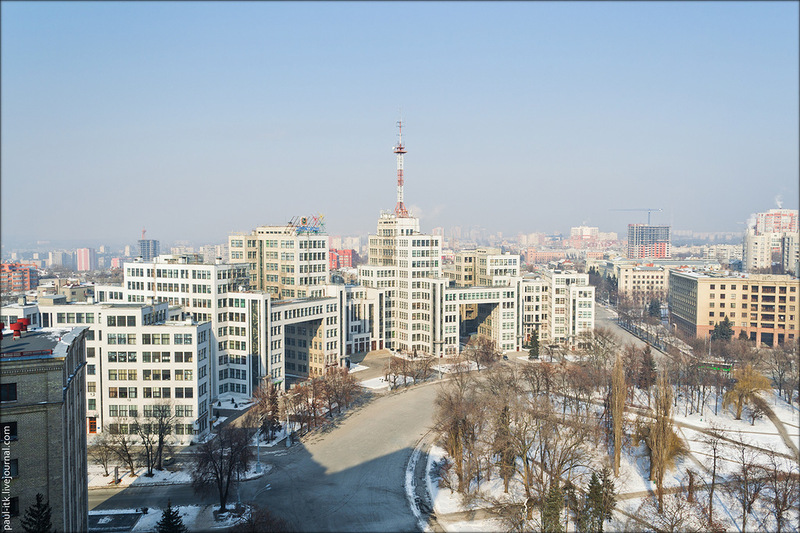 Gosprom is the first high-rise reinforced concrete frame construction in the Soviet Union. The project of the building was worked out by such Leningrad architectures as S. Serafimov, S. Kravzov and M. Felgert. The huge, even by the nowadays standards, high-rise concrete frame construction, counting 4500 windows which need 17 hectares of glass, was built in extremely short period of time: from 1925 to 1928. Different administrative establishments are now there in Gosprom. An apartment building with a spire represents the “Stalin Empire style”. It’s located on the Constitution square, is a high-rise dominating structure of the square and occupies the whole block. It’s high is 7-11 floors. It was built by the project of P.I. Areshkin in 1954. Its’ unique architectural ensemble is known far beyond the Ukrainian boards. The square itself and the buildings around it were built at the end of 1920-s – the beginning of 1930-s of the 20th century. That period has become a turning point for Kharkiv town building. Svobody square is one of the biggest in the world (almost 12 hectares). An unusual shape reminding a bulb, makes its view more expressive. It’s divided spatially on rectangular part spreading to Sumskaya street and on rounded one, bordering with Lenina Ave. where the park is located in its center. 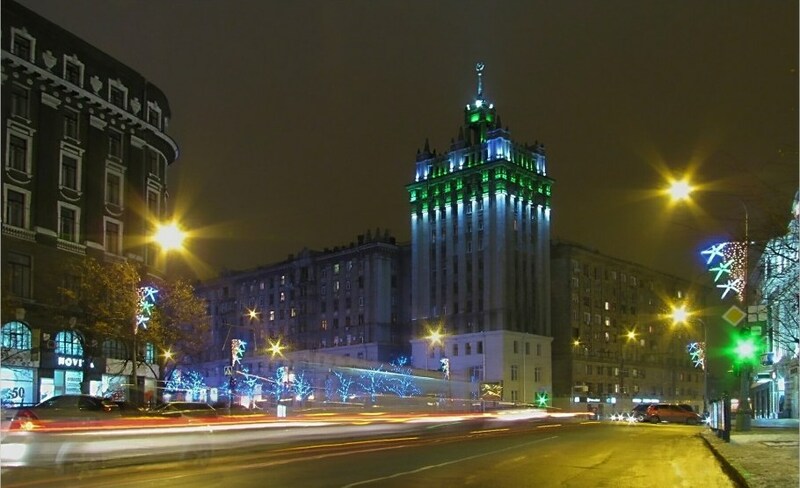 The length of the square is 750 m, the width of the rectangular part is 130 m, diameter of the circle is 350 m. “Kharkiv” hotel and office buildings join it from the north side, Kharkiv regional state administration building from the east (from Sumskaya street). The Palace of youth and T. Shevchenko garden are situated along the southern side. In the rounded part of Svobody square there are 3 main buildings: Gosprom, Kharkiv national university of V.N. Karazina and the Military university (now the study building of KhNU of V.N. Karazina).